Women in The Church of Jesus Christ of Latter-day Saints have been called on by church leaders to respect a divine division of the sexes: Motherhood is the sacred privilege of women, and the priesthood—basically the divine authority to act in God’s name—is the sacred power of men. For almost the entire history of the church, patriarchy has ruled. Men, from the prophet down to neighborhood bishops, set rules, policies and budgets, governing all members, male and female. But it wasn’t always that way. The group of LDS women agitating for the priesthood to be given to female members say they’re not asking their faith leaders to boldly leap into the future, but to step back in time to the beginning of the church and consider the model set up by its founder and first prophet, Joseph Smith. On March 17, 1842, in Nauvoo, Ill., Smith convened a group for the creation of the Nauvoo Female Benevolent Society. Smith, his apostle Elder John Taylor and a group of about 20 women gathered on the second floor of Smith’s Red Brick Store, a two-story building where dry goods were sold on the first floor, and revelations were received and church business was conducted on the second. Taylor ordained the women, and after the newly elected president of the society—Joseph Smith’s first wife, Emma—was instructed on how to conduct meetings, the women brought up their first order of business: disagreeing with the prophet and Taylor over the name of the society. Taylor, according to the meeting’s minutes recorded in the Joseph Smith Papers, had come up with the name, but for Emma, “benevolent” sounded too much like the Washington Benevolent Society, an 1800s political electioneering club with a reputation for corruption. Joseph seemed to think Emma’s preferred tile of “Relief Society” might suggest the group would seek to bring relief to ne’er-do-wells, whereas “benevolent” was a popular word. With that, Taylor graciously conceded the point, and a bright, progressive chapter in the history of the LDS Church began. The first Relief Society not only sought to administer assistance to the “poor brethren” in the church, much as the Relief Society does now, but also operated under its own authority, administered discipline to female church members, had its own publications and provided healing blessings to the sick and the infirm in the church. 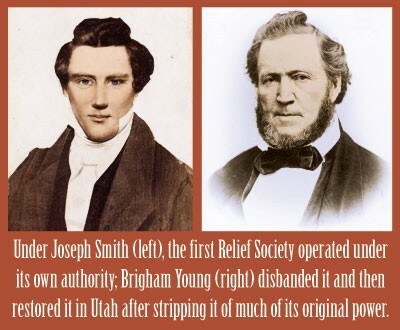 But the death of Joseph Smith, and the power vacuum he left behind, set off a chain reaction that not only cleaved Emma Smith from the church but also led to the disbanding of the Relief Society as it was first set up. When Rigdon’s bid failed, the Latter-day Saints moved west and Emma remained behind. Young would disband the Relief Society and not revive it until after settling the Saints in Utah, when the society was changed to the more advisory role it’s maintained since, operating “under the direction of priesthood leaders,” according to LDS.org. But now, 171 years after Emma Smith changed the Benevolent Society’s name to the Relief Society to reflect an institution that would come to the rescue of those saints calling for help while the church navigated the perils of history’s rapids, many members, dissatisfied with women’s roles, the attitudes toward gay marriage and other issues, are responding by jumping ship or calling for change. 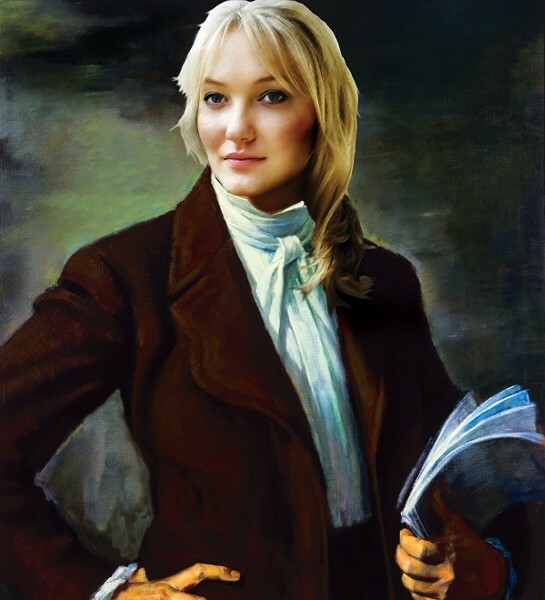 Members of Kelly’s Ordain Women group are calling for leaders to consider Joseph Smith’s original vision of women’s roles in the church and are asking for the priesthood; the group’s first major step is seeking access to the church’s Oct. 5 Priesthood Session, which is reserved solely for male members. But perhaps the greatest challenge that Ordain Women faces isn’t from fellow feminists or even church leaders, but the millions of women in the church, many of whom don’t want the priesthood. Authors Robert Putnam and David Campbell surveyed LDS women in their 2010 book American Grace: How Religion Divides and Unites Us and found that 90 percent of LDS women were opposed to the idea of female ordination. Meanwhile, some women are finding new purpose in their spiritual lives by not only advocating for priesthood for women, but also, they say, using the priesthood’s powers—without official church sanction—to perform healing blessings on other women. Kelly says she wants to initiate a dialogue that will get members discussing where the church has been and where it’s going. She notes there’s some debate about the meaning of the priesthood, since some say that women who are worthy of LDS temple ceremonies already have priesthood powers, but she hopes current members will look to the past while praying for the future. She recognizes that women in the church enjoyed priesthood-like powers for only a few years before their leadership was reorganized, but she rejects the idea that the church’s books of policy are closed when it comes to women in the church. Kelly grew up LDS in Oregon, where she was often one of only a handful of Mormons in her school. She says she grew up feminist by example, living in a home where both her parents worked and shared household duties equally, but she didn’t quite realize she was a feminist until she went to college at Brigham Young University and got a taste of Utah County culture, with its clearly and rigidly defined definitions of what men and women are supposed to do. Kelly survived the Utah experience, graduated and moved on with her life, joining a Washington, D.C., law firm focusing on international human rights. As part of her work, she’s traveled to the Western Sahara and worked with indigenous women fighting for equality. She says she was blessed to meet Aminatou Haidar, a woman of Gandhi-like prominence in the region who continued to advocate for equality despite being subject to repeated imprisonment by the government. Haidar even spent years jailed in Western Sahara’s notorious Black Prison, where she went on a hunger strike to protest the torture of her fellow prisoners. Coming home from the Sahara, Kelly says, she realized she had a battle closer to home to fight. Kelly realized that for women in her own faith to stand up for themselves and have their voices heard, they would need to do so from a position of authority. As priesthood holders, they would be able to help direct policies that empower instead of alienate their fellow sisters. While Kelly says she understands the trepidation most LDS women have about ordination, she sees it as an example of why there needs to be more dialogue on the subject; women should have the ability to candidly engage with the idea. And, she says, it’s up to women in the church to help guide their leaders to revelation.